Religion has always played an important role in U.S. politics, from the writing of the Constitution to the most recent presidential elections. The subjects of religion and politics in America seem to perpetually spark passionate debate and study. Issues such as abortion, capital punishment, prayer in public schools, and family values keep religion and politics closely entwined in American public life. 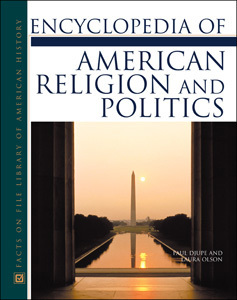 Encyclopedia of American Religion and Politics is an A-to-Z reference covering all facets of American politics and religion, from the early days of the American republic to the rise of the political power of the Christian Right. More than 500 entries cover key religious and political leaders, important historical events, descriptions of court cases, concepts, and religious denominations. "This is an outstanding encyclopedia for a popular audience, and an exhaustive index makes the wealth of information readily accessible. High school and college students will find it useful." "This work offers general information for the beginning researcher and could be used as a springboard to further research." "The writing is clear, objective, and to the point...a starting point for student research." "Written by a team of 135 scholars of religion and politics, the articles serve as a reference for people searching for basic and detailed information, as well as a gateway to further reading (bibliographies are provided)...the encyclopedia is timely and accessible...Recommended for most reference collections in public libraries." "...well-researched and clearly written...The detail is impressive and even a brief reading catches the interest of the user...This handsome book is a well thought out work of reference, clearly presented and well written, that will appeal to a wide readership. Essential to all concerned with American life and politics."